Cypress Pressure Washing is your full service exterior window washing and window cleaning company. Single pane windows, double pane windows, to storm windows, we clean them all. We are the company to depend on for all your window washing, window cleaning, pressure washing, and roof cleaning needs. 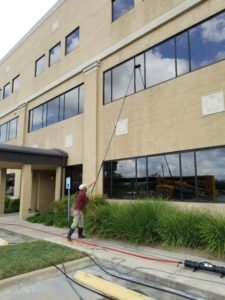 Servicing both residential and commercial properties, Cypress Pressure Washing is the company for your exterior window cleaning needs. Our superior window cleaning process cleans your windows, leaving exceptionally clean windows protected from the elements of mother nature. 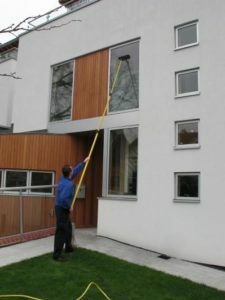 Does your window cleaner have the experience to effectively and efficiently complete your job on time? Since 2006, we have been washing windows and cleaning the exterior of homes and businesses. With this experience, you know you can trust us, because we are the true professionals. Is your window cleaner properly trained in safe practices? At Cypress Pressure Washing, our technicians are trained to the fullest extent on chemical safety, ladder safety, extension pole safety, and every other procedure that we offer. We perform continual training on a regular basis to keep the safety procedures fresh in their minds at all times. Is your window cleaner knowledgeable about proper cleaning methods and glass quality issues? Our service technicians attend mandatory employee education meetings. This not only gives them the chance to further their training, but also gives our trainers the chance to introduce new tools and methods for cleaning advanced window coatings and films. 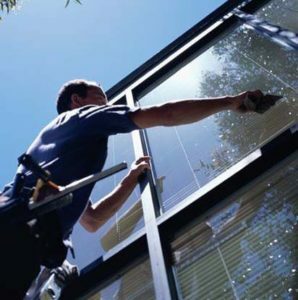 At Cypress Pressure Washing, our technicians are trained and educated in all areas of proper window cleaning methods and glass quality such as scratch prevention, water spot prevention & restoration services just to name a few. Does your window cleaner represent him or herself in a professional manner, making sure that you can take pride in the quality service provided to your home or business? Our crew members arrive in clean, professional vehicles marked clearly with our logo, so no confusion is made of what company they are with. All of our employees go through extensive background checks when hired, therefore giving you the feeling of security while they are present. We will only enter your home wearing shoe covers, to protect your floor/carpet. Trained and educated, all of our employees use the best available tools and chemicals, therefore you know you are in safe hands with our company. A water-fed pole system uses purified water in conjunction with a tool to clean windows, building surfaces, vinyl awnings, truck trailers, cars, etc. Purified water is a natural cleaner, and when used correctly to clean it dries leaving no residual spotting. Purified water is great for cleaning, because it attracts the dirt from the surface being cleaned like a magnet. The purified water wants to collect dirt and become dirty water again. Once becoming dirty again, it then drags the dirt down to the ground with it. Our system triple filters the water, which allows us to have the purest water available to clean your windows properly. Tap water (city water) has a number different kinds of dissolved solids held in suspension in the water. We use multiple water purification systems that will purify the water in your area and allow you to take advantage of this economical and efficient process. 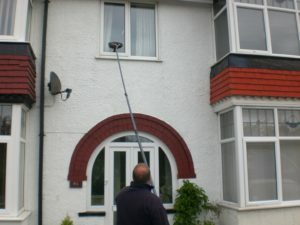 Hand cleaning window washing is the old method used by most window cleaning companies just starting out. At times, there are needs to use this older style method to get hard to reach, or awkwardly shaped windows. 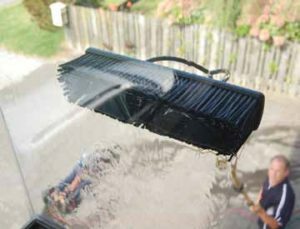 Using a mop head and a squeegee, along with the right window cleaning chemicals, your windows will come out just as crystal clear as using the purified water wash system. Whether we use the hand clean or water fed pole method, you can rest assured that your windows will be the cleanest in the neighborhood.